Dumfries and Galloway’s Spring Fling will be bringing out the creative talent of younger visitors – with lots of opportunities for children to make their own art and craft. More than a dozen of the 94 participants in Scotland’s premier open studios weekend, from 25 to 27 May, are offering special activities for the young. Professional artists and craft makers are also running five workshops, either side of the main weekend, where children can do everything from lantern-making and drawing to creating concertina books and throwing pencil holder pots. 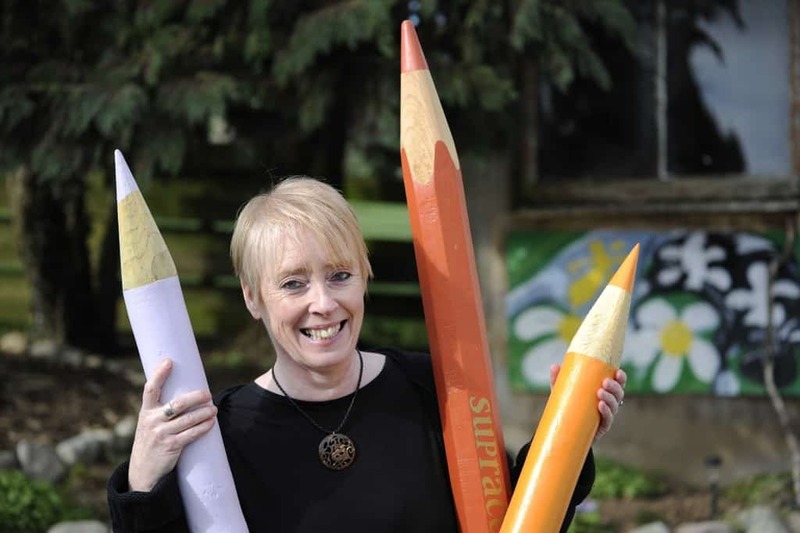 One of the fun things for children to do is take part in the hunt to find giant pencils and crayons in the garden of illustrator Val Macadam near Kirkbean (studio 56, on the Spring Fling Orange Route). The artist is well-known for her quirky and humorous pictures that are inspired by country life. And anyone who was a fan of Jackie or Blue Jeans magazines may well have encountered her work when they were young – she illustrated their short stories and drew the Just Janey cartoon strip in Catch. She also drew some of the pictures in Shout that were used to illustrate young readers’ letters in the Embarrassing Moments column. On the lead up to the Spring Fling, there is the SF Pop-UP at The Oven on Dumfries High Street. Visitors can see artists and makers at work, book a kids’ workshop, buy art and craft or pick up a brochure and start plan where to visit during the main weekend. Joanna Macaulay, Events and Exhibitions Manager for Upland which runs Spring Fling, said: “The bank holiday period at the end of May is a special chance for families to spend time together – going on outings or taking a short break. Spring Fling studios make an ideal destination as many are family friendly and there are lots with fun and creative activities for younger visitors. Spring Fling is a much-loved feature of the Scotland’s cultural calendar, which sees dozens of studios across the beautiful region of Dumfries and Galloway, throw open their doors to the public. It’s a chance to meet painters, original printmakers, ceramicists, jewellers and glassmakers, wood and metal workers, photographers in the cottages, farms, galleries, mills, converted churches and other places that they work and live. This year there will also be a specially commissioned piece of public art called WaterOrgan which will be seen, and heard, on the River Nith. Full details of the workshops and studio activities are detailed in the brochure or can be seen online at www.spring-fling.co.uk. A carefully curated exhibition of work by some of this year’s Spring Fling participants, plus demonstrations, talks, a children’s activity corner and the chance to book workshops, bus tours or pick up a brochure. Lasting to 13 April 2019 at The Oven, High Street, Dumfries, DG1 2QT. Monday to Saturday 10am to 4pm and Sunday 12pm to 4pm. Jewellery maker Alison Macleod – beaded necklace making. Visual artist Giulia Fiorista – drawing club.